This indicator presents the consumption of final energy defined as the sum of energy consumption of all final consumption sectors. These sectors include manufacturing and construction, transport and other uses (households, services and agriculture fall under this category). Final energy consumption is expressed in energy units (ktoe – one thousand tonnes of oil equivalent). 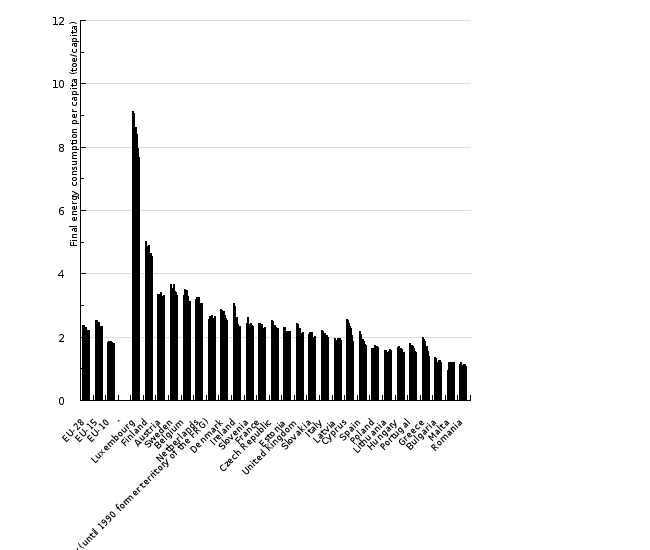 Calorific values of individual fuels are used for conversion from mass units. The indicator may be presented in relative (the relative contribution of a specific sector to total final energy consumption) or absolute terms. For presentation in absolute units, ktoe is used. Analysis of trends in final energy consumption by sector enables the assessment of progress in the field of efficient energy use and reduction of energy consumption policies. The use of final energy obtained from fossil fuels directly affects the emissions of air pollutants and greenhouse gases. Reduction of final energy consumption is important from the perspective of providing reliable energy supply and competitiveness of economy, as well as from the perspective of reducing environmental impacts through the reduction of emissions of air pollutants, greenhouse gases and others. Statistical Office of the Republic of Slovenia, 2015; Jožef Stefan Institute, 2015, Eurostat, 2015. Statistical Office of the Republic of Slovenia, 2015; Jožef Stefan Institute, 2015. 9% reduction of final energy consumption will be achieved by 2016. Final energy consumption in 2014 was 4,607 ktoe, which was 4% below the values in the preceding year. 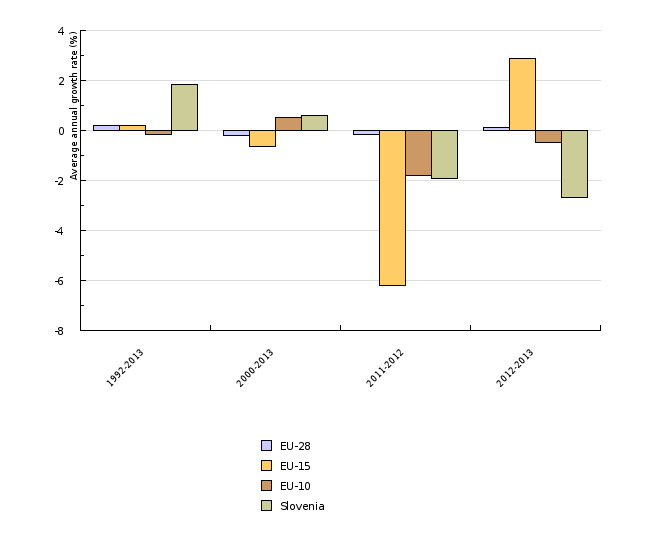 The reduction was largely a consequence of warmer winters, improved efficiency of buildings and the change in the relationship between prices of motor fuels in Slovenia and neighbouring countries, which influenced the reduced use of fuels in transport. The only sector in which energy consumption increased, due to economic growth, was manufacturing and construction. Interestingly, the use of renewable energy sources and waste in this sector increased by as much as 39%, from 81.9 ktoe in 2013 to 113.8 ktoe in 2014. In the period 1992–2014, final energy consumption increased by 40.5%. Inter-year growth gradually decreased, while energy consumption was reduced towards the end of the period. Final energy consumption was at its highest in 2008 at 5,266 ktoe. The average annual change in final energy consumption in the period 2010–2014 was -2.0%. In the latest projections of energy consumption used for the preparation of the third energy efficiency action plan, average annual growth in final energy consumption was estimated at 0.3%. The highest share of final energy is used in transport (40%), followed by manufacturing and construction (27%). 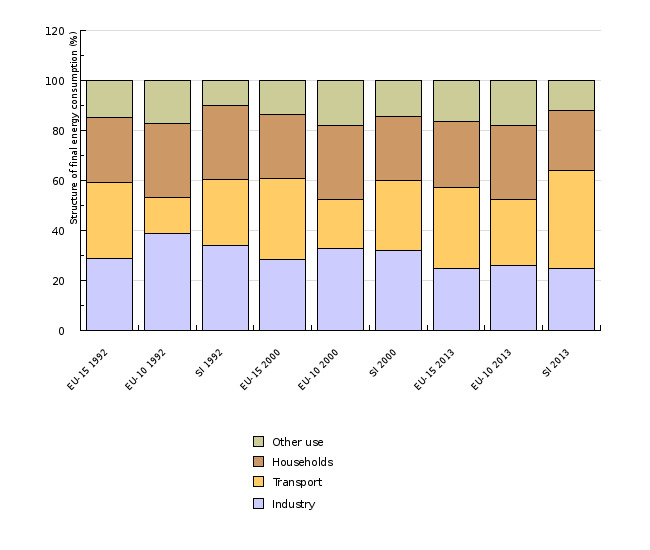 Households, with 23%, occupy third place, while the lowest share is recorded in other use (11%). The structure has changed markedly since 1992. The share of transport increased significantly, along with an increase in the "other use" category, while the shares of manufacturing and construction and households decreased. In 2014, 106% (934 ktoe) more energy was consumed in the transport sector than in 1992. In 1997, the first consumption peak was reached due to the effects of fuel tourism, after which consumption decreased until 2000 due to measures taken in neighbouring countries. In the period 2000–2008, a second notable growth in energy consumption in transport was recorded, with an average annual growth rate of 6.7%. Growth was particularly intensive in 2007 and 2008, after which a notable decrease was recorded, followed by stabilisation. In 2014, energy consumption in transport was 1.5% higher than in 2010. 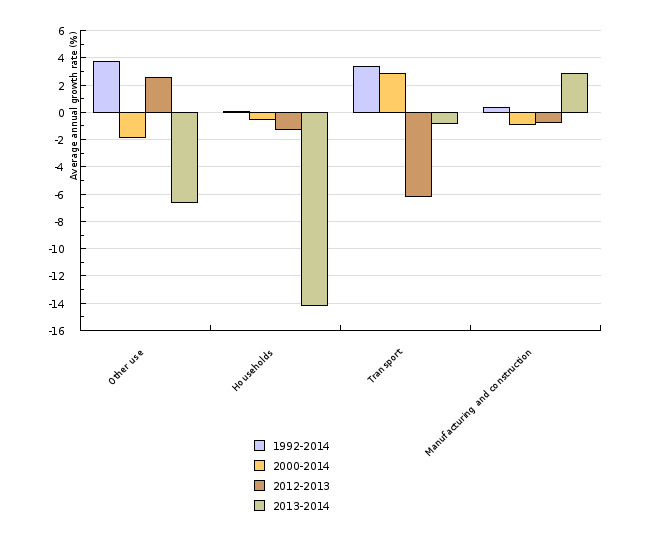 A high rate of growth in energy consumption in transport up until 2008 was a consequence of increasing motorisation of the population, an increasing number of kilometres per car and economic growth, while after joining the EU, increased transit combined with lower prices of motor fuels in comparison with neighbouring countries was an important generator of the increased consumption of liquid fuels (Božičnik, 2006). Reduced energy consumption in 2009 was largely a consequence of economic prices, while a change in the relationship between prices of motor fuels also contributed. In the years that followed, growth coincided with the lower prices of motor fuels in comparison with neighbouring countries, while decline coincided with higher prices. Until 2008, the number of car kilometres on state roads had been increasing, while since then, they have remained relatively stable. In the "other use" sector (including services and agriculture), final energy consumption in 2014 was 125% higher than in 1992. This is largely a consequence of the increase in 1997. Since 2003, a decreasing trend in energy consumption has been noted. Energy consumption in this sector is calculated as the difference between total final energy consumption and final energy consumption in the sectors of manufacturing and construction, transport and households, which can result in notable inter-year variations. In 2014, energy consumption decreased by 6.6%, probably due to the warm winter. In 2013, final energy consumption increased by 2.6%, largely due to the increased use of natural gas. 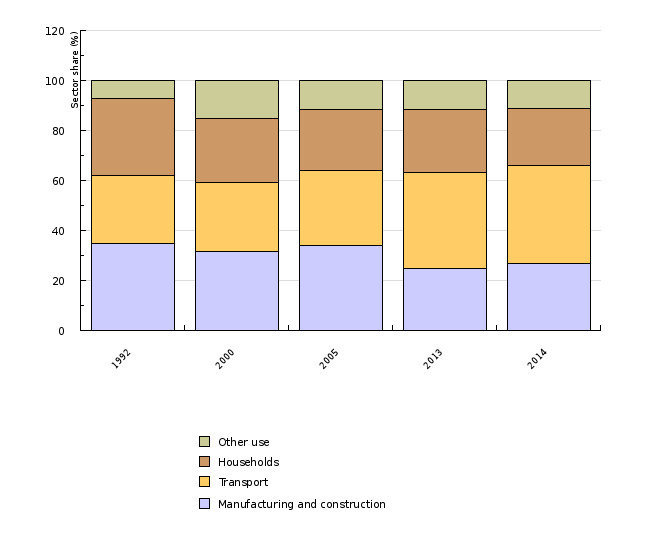 After a period of growth, final energy consumption in manufacturing and construction decreased between 2007 and 2009. After 2009, energy consumption stabilised at the 2002 level, with slight fluctuations. Energy consumption in industry was strongly influenced by the economic crisis, while energy efficiency measures (see indicator EN32 Energy efficiency and energy use in sectors of final energy consumption) were also being intensively implemented. In 2014, energy consumption increased by 3% as a consequence of economic growth. Compared to 1992, energy consumption was 7.5% higher, while compared to 2000, it was 12% lower. 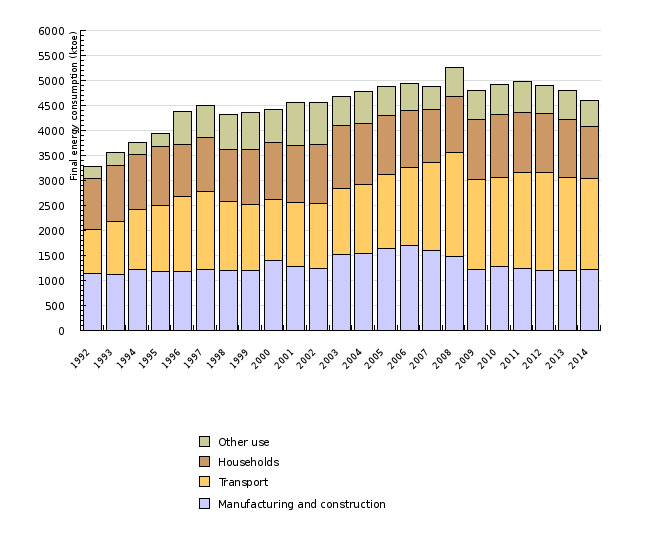 After a period of increase after 1998, final energy consumption in households decreased in the period 2004–2007. It increased again in the period 2008–2011, after which it began decreasing again. In 2014, final energy consumption in households decreased by 14.2%, which was largely a consequence of an extremely warm winter. Trends in energy use in households are importantly influenced by the implementation of energy efficiency measures, e.g. insulation facades, roofs, replacement of doors and windows (see indicator EN32 Energy efficiency and energy use in sectors of final energy consumption). Increased energy consumption in 2008 was a consequence of a postponed purchase of liquid fuels from 2007 to 2008 due to growing prices as well as lower temperatures in 2008. In 2009, it was a consequence of the improvement in renewable energy statistics in households, while in 2010, it was caused by a cold winter. In future, final energy consumption will have to be kept under 5,118 ktoe through the implementation of measures under the Energy Efficiency Action Plan and the Renewable Energy Sources Action Plan. If not, the 2020 goal for the RES share will be extremely difficult, if not, impossible, to achieve. The greatest potential for reduction is in the public sector, buildings and transport. In 2014, energy consumption was 10% below the target value. In 2013, final energy consumption per capita in Slovenia was equal to the EU-15 average. Compared to the EU-15, the structure of consumption in Slovenia shows a similar share of manufacturing in final energy consumption, while the share of transport was notably higher, the share of services and agriculture was markedly lower and the share of households was slightly lower. Policies directed towards the reduction of final energy consumption are jointly called "measures to promote efficient energy use." In Slovenia, these measures are defined in the Energy Efficiency Action Plan for the period 2014–2020 and summarised in the Operational Programme for Reducing Greenhouse Gas Emissions by 2020. In 2008, within the implementation of the Directive on Energy End-use Efficiency and Energy Services, the first of the three energy efficiency action plans for the period until 2016 was adopted, while in 2011, the second action plan was drawn up. Energy savings as a result of the implementation of measures in the period 2008–2016 amounted to 4,273 GWh.